Edward is a very strong protagonist. Strong and very emotional story. Too many “Tail” and “Eavesdrop” objectives. Assassin’s Creed IV: Black Flag is the sixth main installment in Ubisoft’s Assassin’s Creed series, serving as a sequel to Assassin’s Creed III, introducing and advancing the new plot of the series now that Desmond’s sacrifice stopped the end of the world; even though from the Animus point of view the game is a prequel, relating the life of Edward Kenway, grandfather to Connor, Ratonhnhaké:ton, the protagonist of Assassin’s Creed III. Assassin’s Creed IV, from the moment I launched the game for the first time, to even now as I’m playing through the fantastic DLC Freedom Cry, seemed like an evolution to the series and an upgrade to Assassin’s Creed III in many ways, both on its streamlining of some mechanics and throwing away the tired ones, and on storytelling and characterization. 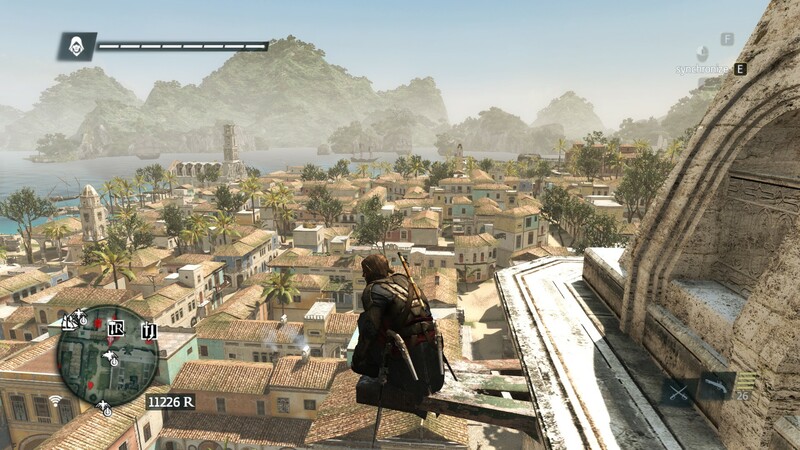 First of all, and the highpoint of the game, is sailing, and while the navigation and handling hasn’t changed, combat is now much more streamlined, and unlike Assassin’s Creed III, in Black Flag you can put the brakes to the ship and jump off at any point, which works wonders with its Caribbean Sandbox. 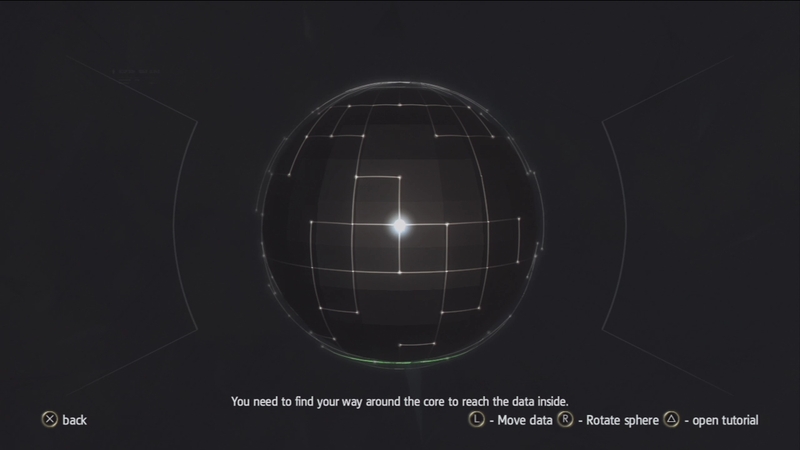 In Assassin’s Creed IV, the seas are open to you; and with the exception of major cities like Havana and Kingston, there are no transitions from the ship to shore. As I said, you can jump off and swim to shore or dock your ship if the island allows it. Weigh-hay and up she rises. Weigh-hay and up she rises. Early in the morning! On combat’s streamlining, some things have changed, making them less critical or “ship-crushing”. Chain shots aren’t the ship-breakers they used to be, which is somewhat disappointing, but instead act as stunning shots, stopping all activity from the enemy vessel for a few seconds, giving you a chance to put in another shot or get the hell out of dodge. One of the more frustrating aspects of ACIII’s naval combat, finding the “weak points” in the hull to use the swivel guns, has been completely reworked; now all shots have a chance of triggering one or many weak spots to use swivels on for extra damage. The Notoriety System is gone, you don’t need to go ripping posters anymore and it’s something I welcome. As they explained in an interview, the system didn’t make sense if you’re island hopping. Instead you have now a Pirate Hunter Notoriety, which both makes sense and doesn’t impeded you from performing tasks or missions, just adds a nice level of difficulty to it, spawning Pirate Hunter ships of varying difficulty; but it gives you the freedom of being a wanted man, and an infamous pirate as much as you want, without it hampering your progress. Three, four, five, it doesn’t matter, they’re dead anyway! Assassin’s Creed IV features the return, sort of, of the Tower mechanics from both Brotherhood and Revelations, with Forts, cannon-strapped fortresses you’ll find the middle of the ocean, making all waters around them restricted areas and attacking you as soon as you get too close. Destroying them dispels their influence, reveals all collectibles in the area, become fast-travel spots and give you access to Naval Contracts, so getting them down has a lot of benefits and the fights themselves are pretty intense depending on the Fort’s strength and your ship’s upgrades. For those wishing an extra hard battle, Black Flag includes four Legendary Ships, of massive scale and weaponry, capable of downing your ship before you even put a dent in them. 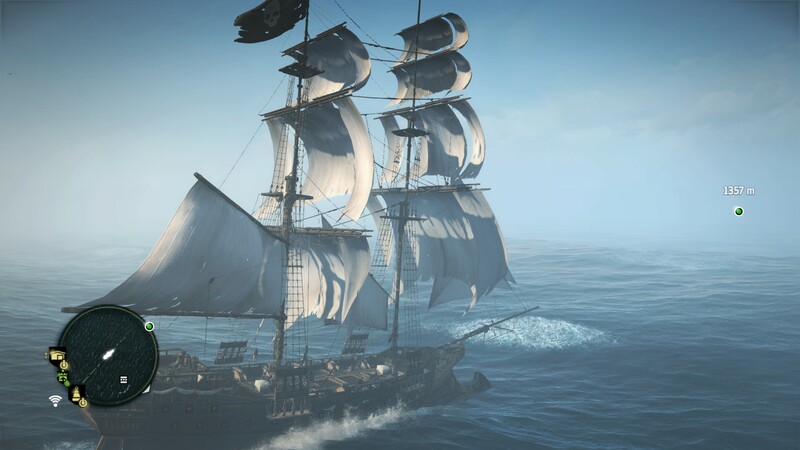 Speaking of upgrades, in Black Flag you have the chance to upgrade both Edward’s equipment (armor, pouches and gun holsters) and the ship, the Jackdaw. For that, you need both money and a lot of it, and more importantly, crafting materials, acquired from hunting as you did with Connor, from Pirating for Metal, Wood and Cloth, and from Whaling, harpooning both sharks and whales. You can acquire most at the general stores though, but at exorbitant prices. Getting the Pirating materials and currency can get very grindy, and you’ll need to scour the seas to find ships carrying the material, since not all carry all materials or the same amounts, and the required amounts can get rather high. Sadly, on the mechanics, both Tailing and Eavesdropping are still in the game, and are abused to the point of nausea, with every other mission asking you to tail, eavesdrop, or both, sometimes right in succession to one another. There are too many of these in the game! Combat is very much the same but there are a few cool things, like free aiming for projectile weapons, which is a blessing, though you can still press a button a quick-use the gadget. The reloading nightmare that were guns in ACIII is still present though not as significantly with Edwards ability to carry up to four guns and use them in quick succession, meaning you can clear a wave of enemies before you actually have to reload. Edward, with his Privateer background, is an exceptional fighter, better than most of Assassin’s Creed’s protagonists, and fighting with two sabers is just too damn cool. On the “gadget” side of things, slots for small weapons (knives) are gone, which I thought was very good considering I never really used anything but swords, hidden blades and fists. You can still pick up weapons and use them, but now you just buy swords and pistols, and ammunitions for the other ranged weapons, with the overpowered (and my favourite) smoke bomb returning once again, letting you wipe out a room as long as you can keep dropping them. There aren’t any bows in this one, but instead, Edward makes do with blow darts, sleeping and the, extremely overpowered, berserking darts. One hit of the latter and the target goes mad and attacks everything in sight and when the effect ends, they die. Better yet, the rampaging enemy doesn’t cause alarms to go out, so you can have a compound kill itself and still get stealthy objectives done. Those need some rebalancing to be honest. Like many Assassin’s Creed games, there are plenty of collectibles to be found around the world, both in hubs and scattered around the seas and while chests are useful and the small bottles give you excerpts from a very interesting memoir, the Animus Fragments are completely worthless and are a throwback to other useless collectibles in the series, such as the many flags you collected in the first game or Brotherhood and which I honestly believed the series had outgrown, as they do nothing but bloat the completion aspect of the game. Crikey, I hope that one doesn’t kill me! Things are a bit slimmer on secondary missions, with only Contracts being in the game, normal and naval, but they make up for it by setting some targets on different islands, and sometimes starting on one and escalating into a naval battle. 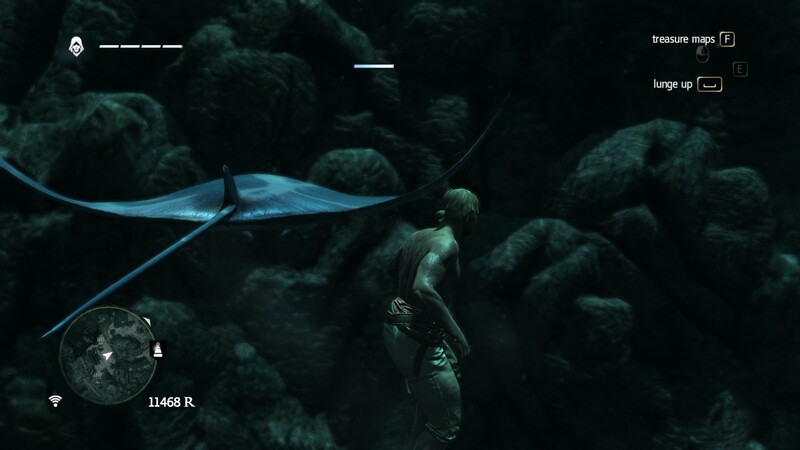 Diving is a new activity which you sadly get access to late in the game but is quite enjoyable and forces you to try to be as stealthy as possible while swimming in shark infested waters. The other side activity is freeing pirates from captivity, which happens in an event style. 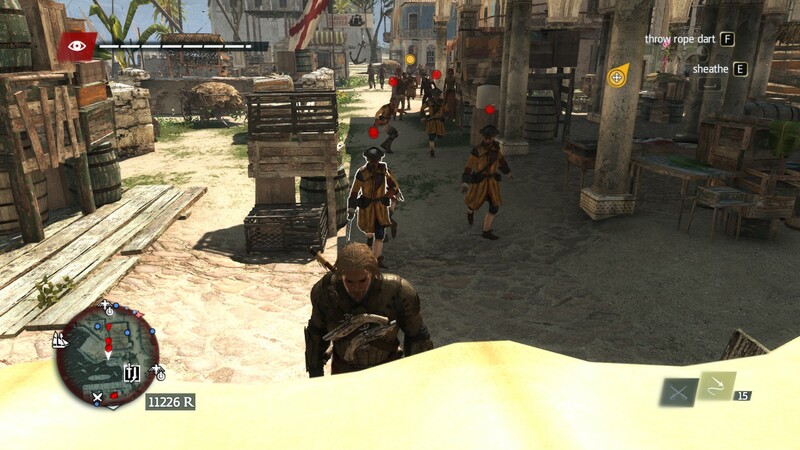 At any given point in the game, in a city or an island, you might see the pirate release icon pop up, marking where a pirate needs help; releasing them means they’ll join your crew, though you can never have more than the maximum set by your upgradeable crew’s quarters. The Crew is another resource to manage, as its size improves your chances of boarding a ship once you’ve disabled it. On the present day side of things, you control a new Abstergo Entertainment employee, the Abstergo branch selling Animus-experiences as entertainment packages, having perfected the technology to synchronize with other people’s genetic lines, using Desmond’s DNA to further their agenda and significantly line their pockets. At first you’ll just talk to people, but soon you get drafted into hacking computers and it’s more fun than I expected, with each “hack” being a little mini-game puzzle. My only complaint is there isn’t much variety to the puzzle types. Your reward, for hacking, is information, on past characters, on future plans, on historical personages, etc. The Desmond files are particularly good and made me miss the guy a lot. This makes hacking really fun…and while illegal, Abstergo is evil so they deserve it! The Plot for Assassin’s Creed IV has been described as weak compared to previous installments and I have to say I completely disagree. I found the story about the last days of Pirates and the men and women who lived in it and the things they went through a captivating and powerful story. Edward’s own tale of selfish glory hounding and greed, and the subsequent rock bottom hitting and his quest for, not redemption, but just being a better man, was especially good. The McGuffin aspect of the plot, the Lighthouse, while it moves the plot along, is not the focus of it, not as much as the Key was in Assassin’s Creed III, or the Pieces of Eden in those before it. Here it just serves as the rope that binds characters together, but it’s their story that matters, not the object of their desire. And it’s a damn good story. On the present day side of the plot, I will admit the story is a bit weak, and takes maybe too much time to really get in gear, but it’s successful on what it hopes to achieve and that is to present the “current” plot that will develop over the course of the next installments, and give you a glimpse of the major players and what everyone is going for, hinting at a possible third faction in the eternal conflict. On characters and characterization, the present day cast is pretty flat, aside from veterans Shaun and Rebecca, who sadly don’t get as much screen time as I wished. Your avatar is just that, a blank puppet for you to control, with no personality or opinions. Hopefully that’ll change in future installments. Your bosses at Abstergo Entertainment Montréal are dull and uninteresting, but again, hopefully they’ll flesh them out in the future, as I believe Abstergo Entertainment will become central to the present-day plot. The best characterization belongs, once again, inside the Animus. Edward is by far a superior character to both son and grandson, though still not as good a character as Ezio was, but it’s not a fair comparison. Edward is a flawed individual but has plenty of redeeming qualities, even at his worst. His charm and swagger is almost contagious and you’ll enjoy every moment of his life on the seas. 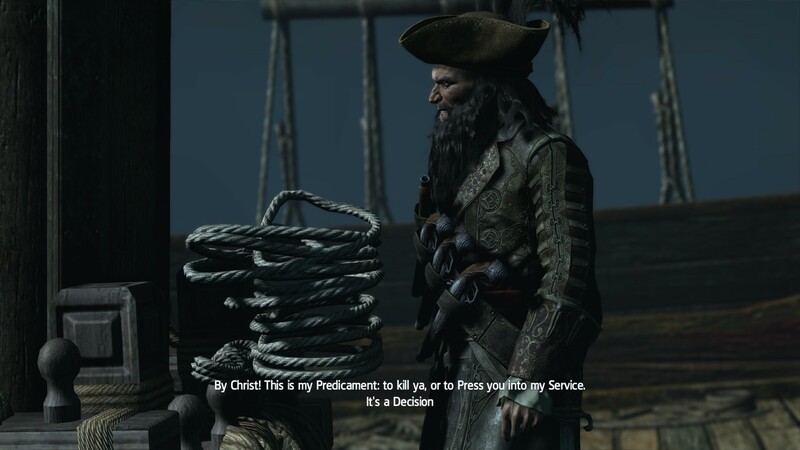 When I first heard of this game, I saw my favourite Pirate would be in it, Edward Thatch, Blackbeard and I was excited to see how he would be represented; and you know what? I wasn’t disappointed, and aside from Edward and the fantastic “James Kidd”, he’s my favourite character in the game. The only characters that seem rather lifeless and dull are the Templars, but aside from the Borgias, that’s usually been the case in the Assassin’s Creed games, since they’re all pretty much just targets. Having said so, the Governor of Havana is a very well done character, and a very shrewd man. 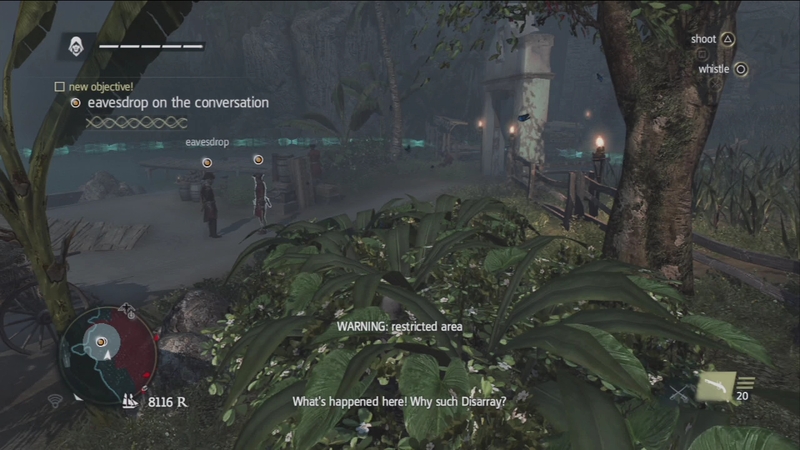 Visually, the game uses an improved version of the Assassin’s Creed III engine, and the sights are breathtaking. The first time I climbed a viewpoint (which by the way, now act as fast-travel stations) and synchronized, I drooled at the Caribbean expanse before me. There really isn’t much to tell about the looks of characters and locations because it’s an Assassin’s Creed game; they’re always majestic and magnificent. I loved the soundtrack, and more importantly the shanties, including my very favourite “Drunken Sailor”. You really get into a plundering mood with a good shanty sounding in the background. Assassin’s Creed IV is not only the next installment of the successful series but also a clear evolution, learning of its past mistakes and cleaning house, streamlining things to make all mechanics more fluid and fun. While it still has its faults and repeats some mechanics to the point of annoyance, the overall experience, encompassing the very powerful personal story about a colorful cast of characters in the last days of Piracy, the great soundtrack and the jaw-dropping visuals, make even those annoyances seem worthwhile. The Mental Attic Score: Worth Overpaying. This game will keep you entertained for hours and hours, I can attest to it, having played it to the point of 95%+ synchronization rate…and I’m still not done, I need to finish a DLC and get those Legendaries down! I’ve got to admit that I’ve never been able to get into Assassin’s Creed. I thought it was great when I first started playing the original, then I just got so fed up with the tailing and eavesdropping that I couldn’t face picking it up again. But after reading what yourself and TDGG have to say about AC IV my curiosity has been piqued!